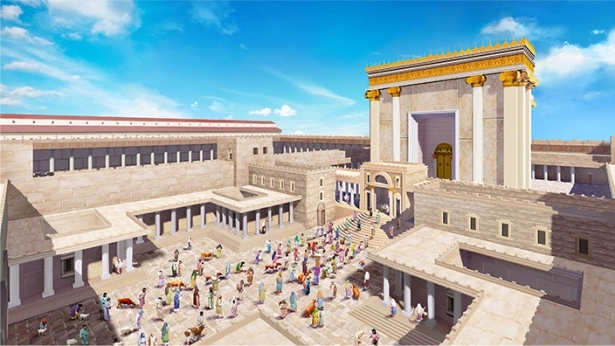 The significance, purpose, and step of Jehovah’s work in Israel were to begin His work on the whole earth, gradually spreading to Gentile nations from its center in Israel. This is the principle according to which He works throughout the universe—to establish a model, then broaden it until all people in the universe have accepted His gospel. The first Israelites were the descendants of Noah. These people only had the breath of Jehovah, and could take care of the basic necessities of life, but they did not know what kind of a God Jehovah was, nor did they know His will for man, much less how they should revere the Lord of all creation. Adam’s descendants did not know what rules and laws they must obey, or what work the created must do for the Creator. All they knew was that the husband must sweat and labor to provide for his family, and that the wife must submit to her husband and perpetuate the race of humans that Jehovah created. In other words, this people had only Jehovah’s breath and His life, but did not know how to follow God’s laws or how to satisfy the Lord of all creation. They understood far too little. So although there was nothing crooked or cunning in their hearts, and though they seldom had jealousy and strife, they did not know or understand Jehovah, the Lord of all creation. These ancestors of man knew only to eat what Jehovah made, to enjoy what Jehovah made, but they did not know to revere Jehovah; they did not know that they should worship Him on bended knee. How could they be called His creatures? And so, were not the words, “Jehovah is the Lord of all creation” and “He created man as an expression of Himself, to glorify Him and represent Him,” spoken in vain? 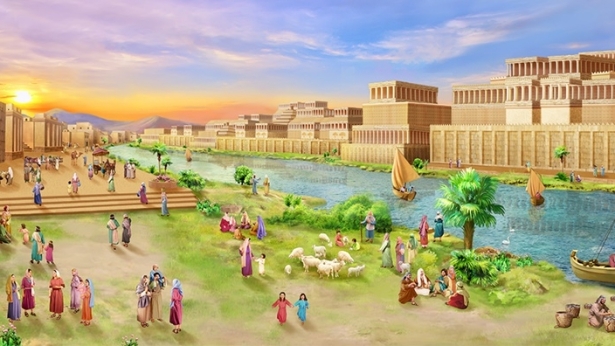 How can people who do not revere Jehovah be a testament to His glory? How can they be expressions of His glory? Do not Jehovah’s words “I created man in My image” then become a weapon in the hand of Satan—the evil one? Do these words not then become a mark of humiliation to Jehovah’s creation of man? In order to complete that stage of work, Jehovah, after creating mankind, did not instruct or guide them from Adam to Noah. It was not until after the flood that He formally began to guide the Israelites, who were the descendants of Adam and of Noah. His work and words in Israel guided the lives of all the people across the land, showing them that Jehovah was not only able to blow breath into man, so that he had His life, and was resurrected from the dust and made a creature of God, but could also scorch mankind with flames, and curse mankind, using His rod to govern mankind. So, too, did they see that Jehovah could guide man’s life on earth, and speak and work among them by day and by night. He did the work only so that His creatures might know that man came from dust picked up by Him, that man was made by Him. Furthermore, the work He began in Israel was meant so that other peoples and nations (who in fact were not separate from Israel, but had branched off from the Israelites, yet were still descended from Adam and Eve) might receive the gospel of Jehovah from Israel, so that all creatures in the universe would revere Him and hold Him to be great. Had Jehovah not begun His work in Israel, but instead, having created mankind, let them live carefree lives on the earth, then because of man’s physical nature (nature means that man can never know the things he cannot see, that is, that he does not know that Jehovah created mankind, let alone why He did so), he would never know that Jehovah created mankind and is the Lord of all things. If Jehovah had created man and placed him on the earth as His enjoyment, then simply dusted off His hands and left rather than leading among man for a period of time, then all humanity would have returned to nothingness; even the heaven and earth and all things that He created, including all humanity, would have returned to nothingness and been trampled upon by Satan. And so Jehovah’s wish that “He should have a place to stand on earth, a holy place among His creation” would have been shattered. So instead, after God created mankind, He guided them in their lives, and spoke to them, all in order to realize His desire, to achieve His plan. God’s work in Israel was meant only to execute the plan He had set in place before His creation of all things, and therefore His working first among the Israelites and His creation of all things were not at odds with each other, but were both for the sake of His management, His work, and His glory, deepening the meaning of His creation of mankind. He guided the life of mankind on earth for two thousand years after Noah, during which He taught them how to revere Jehovah the Lord of all things, taught them how to conduct themselves and live their lives, and most of all, how to act as a witness for Jehovah, obey Him, and revere Him, and to praise Him with music like David and his priests. In the beginning, guiding man during the Old Testament Age of Law was like guiding the life of a child. Earliest mankind was newly born of Jehovah, who was the Israelites. They did not understand how to revere God or live on earth. Which is to say, Jehovah created mankind, that is, He created Adam and Eve, but He did not give them the faculties to understand how to revere Jehovah or follow the laws of Jehovah on earth. Without the direct guidance of Jehovah, no one could know this directly, for in the beginning man did not possess such faculties. Man only knew that Jehovah was God, and had no idea how to revere Him, what to do to revere Him, with what mind to revere Him, and what to offer up in reverence of Him. Man only knew how to enjoy that which could be enjoyed among all the things created by Jehovah. Man had no inkling of what kind of life on earth befitted that of a creature of God. Without instructions, without someone to personally guide them, such mankind could never lead a proper life, and could only be furtively held captive by Satan. … And so, after the creation of mankind, the work of Jehovah was far from over. He also had to fully guide mankind before Him so that mankind was able to live together on earth and revere Him, and so that mankind would be able to enter into the right track of a proper human life on earth after being guided by Him. Only then was the work that had been principally conducted under the name of Jehovah fully completed; that is, only then was Jehovah’s work of creating the world fully concluded. And so, since He created mankind, He had to guide mankind’s life on earth for several thousand years, so that mankind was able to abide by His decrees and laws, and partake in all the activities of a proper human life on earth. Only then was Jehovah’s work fully completed. Previous：Know the Purpose of the Three Stages of Work of God’s Management of Mankind.